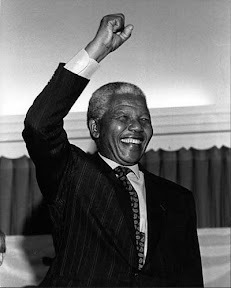 "I was born on 18 July 1918 at Mveso, a tiny village on the banks of the Mbashe River in the district of Umtata, the capital of the Transkei." "The Transkei is 800 miles east of Cape Town, 550 miles south of Johannesburg, and lies between the Kei River and the Natal border, between the rugged Drakensberg mountains to the north and the blue waters of the of the Indian Ocean to the east. It is a beautiful country of rolling hills, fertile valleys, and a thousand rivers and streams which keep the landscape green even in winter…It is home to the Thembu people, who are part of the Xhosa nation, of which I am a member." "The Xhosa are a proud and patrilineal people with an expressive and euphonious language and an abiding belief in the importance of laws, education and courtesy. 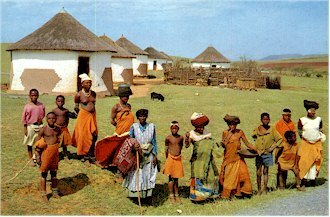 Xhosa society was a balanced and harmonious social order in which every individual knew his or her place." 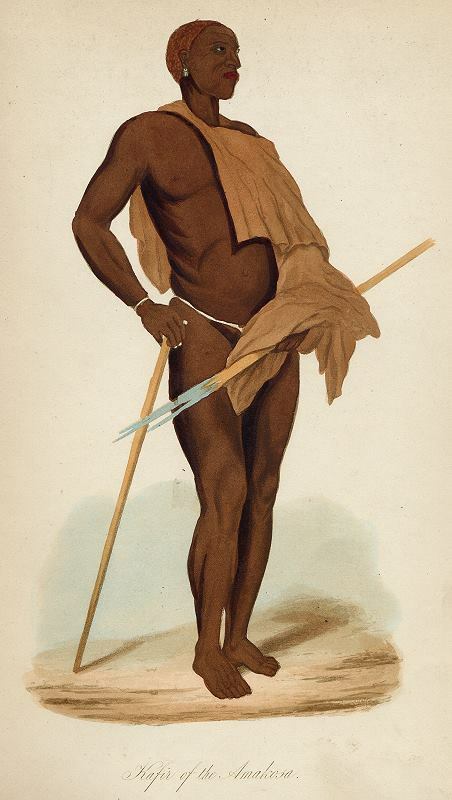 "When I was not much more than a newborn, my father was involved in a dispute that deprived him of his cheftainship at Mveso… He was deprived of most of his herd and land, and the revenue that came with them. Because of our straitened circumstances, my mother moved to Qunu. We lived in a less grand style, but it was in that village that I spent some of the happiest years of my boyhood…." "The village of Qunu was situated in a narrow, grassy valley crisscrossed by clear streams, and overlooked by green hills." "It consisted of no more than a few hundred people who lived in huts, which were beehive-shaped structures of mud walls, with a wooden pole in the centre holding up a peaked grass roof. The floor was made of crushed ant heap, the hard dome of excavated earth above an ant colony, and was kept smooth by smearing regularly with fresh cow-dung. The smoke from the hearth escaped through the roof, and the only opening was a low doorway one had to stoop to walk through. The huts were generally gruped in a residential area that was some distance away from the maize fields. There were no roads, only paths through the grass worn away by barefoot boys and women." "My mother presided over three hutsat Qunu which, as I remember, were always filled with the babies and children of my relations…. 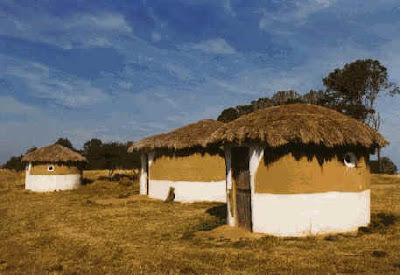 In African culture, the sons and daughters of one’s aunts or uncles considered brothers and sisters, not cousins…"
"Of my mother’s three huts, one was used for cooking, one for sleeping and one for storage. In the hut in which we slept, there was no furniture in the Western sense. 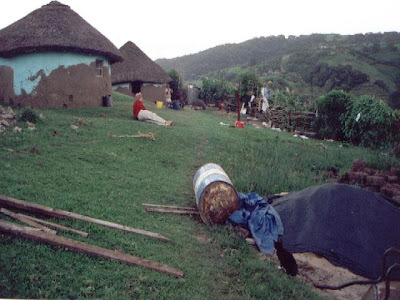 We slept on mats and sat on the ground….My mother cooked food on a three legged iron pot over an open fire in the centre of the hut or outside. Everything we ate we grew or made ourselves." 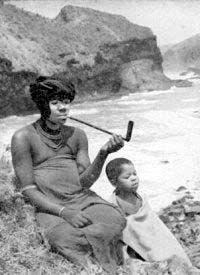 "My mother would enchant me with Xhosa legends and fables that had come down from numberless generations. I recall one my mother told us about a traveller who was approached by an old woman with terrible cataracts on her eyes. The woman asked the traveller for help, and the man averted his eyes. Then another man came along and was approached by the old woman. She asked him to clean her eyes, and even though he found the task unpleasant, he did as she asked. Then, miraculously, the scales fell from the old woman’s eyes and she became young and beautiful. The man married her and became wealthy and prosperous. It is a simple tale, but its message is an enduring one: virtue and generosity will be rewarded in ways that one cannot know."